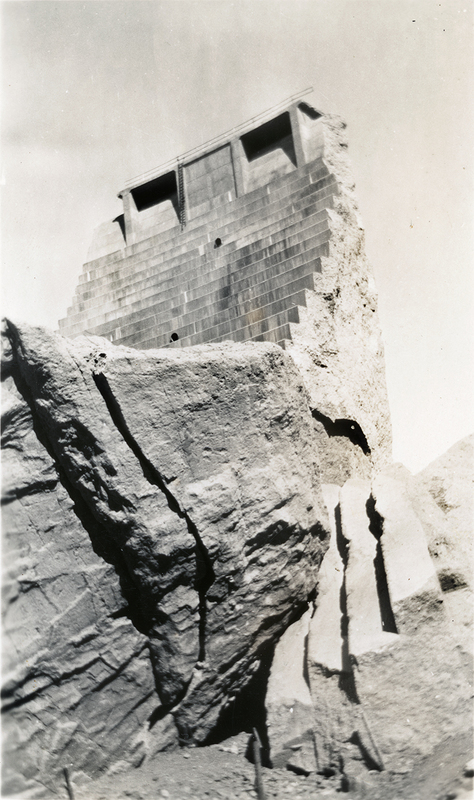 SCVHistory.com DI2819 | St. Francis Dam Disaster | (2) Tourist Photos of the Tombstone with Ladder, 1928. 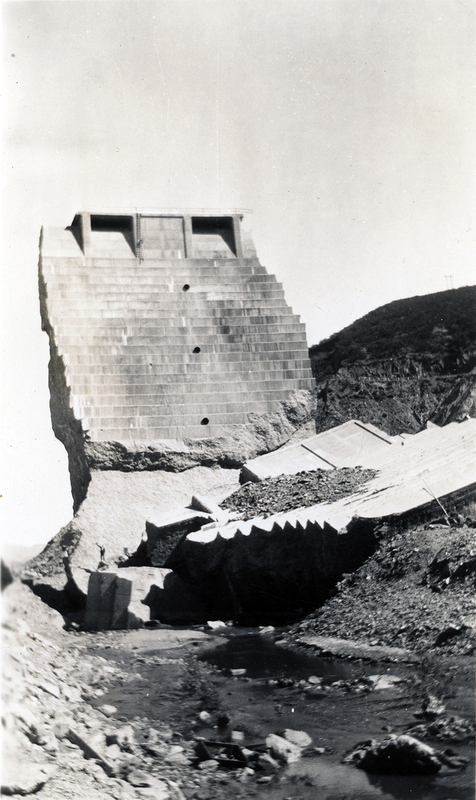 A pair of tourist photos of the "tombstone" — the center section of the St. Francis Dam that remained standing after the dam collapsed on the night of March 12-13, 1928. 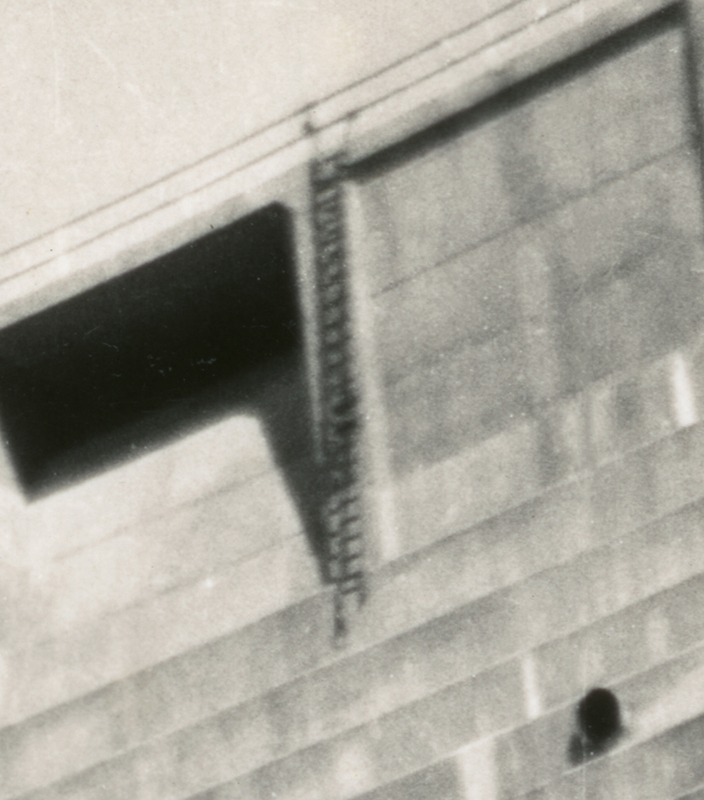 Photographer unknown, 2½x4¼ inches. Note the ladder hanging down from the top of the tombstone in both photos and the man in the lower photo for scale. These are the only two identifiable Santa Clarita Valley photographs among a large grouping of photos (100-plus) purchased in October 2018 at the Saugus Swap Meet (Saugus Speedway). The surname associated with the photos is Calley; first names include Edith (mother), Wayland and Herb (sons) and the name Henderson. It is possible the family moved out to Burbank from New Hampshire in the 1920s. Many photos show Burbank and San Valley. The photos span much of the 20th Century. DI2819: 9600 dpi jpegs from original photographs purchased 2018 by Sharon Divis.